Made from eco-friendly, non-toxic, and heat-tolerant premium plastic - low maintenance, weather resistant, and will not rot. 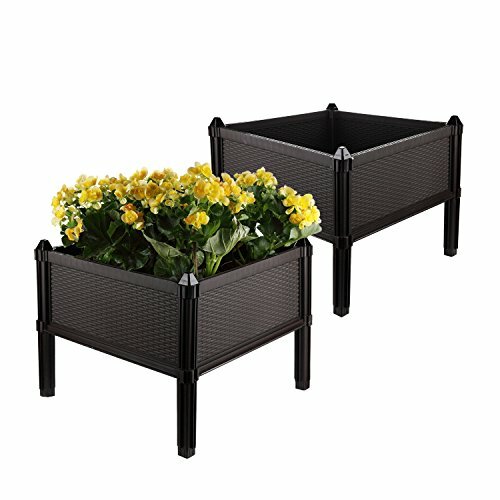 Planter box made from premium PP plastic - sturdy and 100% weather-resistant. Additional drainer holds the remaining water in the garden bed. Holes located at the bottom of each side board provide root ventilation and work as outlets for discharging excess water. Quick assembly, and many DIY combination type when you buy several sets or additional components. Pack of 2; Dimension of one complete box: 19.7" in Diameter,16.5" in Height (Measure from top tip of the box to the bottom of the leg ).